I may have mentioned once or twice that I love the cherry blossoms. Not cherry blossoms, mind you, but the cherry blossoms, the ones that ring the Tidal Basin and the ones that form a pink tunnel on the streets of Kenwood, a neighborhood in suburban Maryland. It’s a once-a-year treat, and if you don’t live in Washington, D.C., catching them at peak is a matter of luck. Walking under cherry blossoms is one of the most beautiful experiences I’ve ever had and the probably most ephemeral. The Japanese even have a name for it, hanami. Which is what seems to happen to me year after year. Even the carpet of petals underfoot was gone. Sixty mile an hour winds two days before my visit scattered their beauty. So I just had memories to go on, calling up the “breath of ecstasy” from past visits. Breath of ecstasy is what poet Sarah Teasdale names our experience of the sublime: the sight of crashing waves (what a great line—blue waves whitened on a cliff), and fire, and a child’s innocent face (another great line—holding wonder like a cup), the sound of music, the smell of pine trees in the rain. These experiences, which we’ve always considered ours for the taking, as in, the best things in life are free, aren’t free at all in Teasdale’s vision. Life has loveliness to sell, she writes, and the cost is high, a year of strife, perhaps, or even all you have been, or could be. I’m having trouble understanding how that barter works out in real life, how it might cost me, in real terms, to seek beauty. I’m not going to sell my house so I can live in Iceland for a year to see the northern lights. But I can see how easy it is to stay in bed instead of getting up to see a sunrise, or how much less it costs me to stay warm in front of the television instead of putting on a coat to look at a winter moon. Easier still to Google a photograph of the northern lights and tick it off my list of beautiful sights to experience. Teasdale’s poem reminds me that effort, not just attention, is required to experience such beauty, and in this post-Romantic, technology-mad world, effort is the price of loveliness. It’s an old-fashioned poem, not perfect, a little clunky in parts, a little inflated in others, but there’s much to enjoy. The passion, the high-minded feeling, the Romantic yearning for the sublime—they don’t make such poems anymore. Outside of a spiritual context or yoga class, no poet today would write like this, unless the poet was being ironic. But how else to capture that most essential human feeling of being overwhelmed by beauty? We need these old poems, we need these old poets to express our awe, our wonder and straightforward joy. Sara Teasdale (1884-1933) was born in St. Louis, the youngest of four children. A sickly child, she was home-schooled till age nine. She started publishing her poems in her early twenties. Her work was well-received, and in 1917 she was awarded the Pulitzer Prize. In 1914 she married Ernst Filsinger, an admirer of her poetry, after rejecting several other proposals. They moved to New York City in 1916 and lived on the Upper East Side. 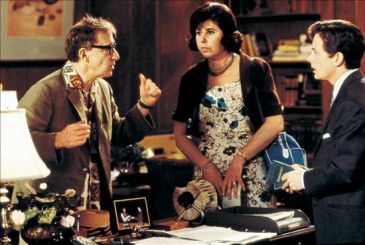 He travelled often, and during one of his trips, she moved away without telling him so she’d be eligible for divorce, much to his shock. They divorced in 1929. She re-kindled a friendship with an old boyfriend, poet Vladmir Lindsay. Lindsay was married by this time. He committed suicide and two years later she did at age 48. A few years ago I left a poem of hers in the cosmetic aisle of Target. You can read that here. Also worth noting: her lyric poems seem to be popular with choral groups. Link here for one very lovely example. 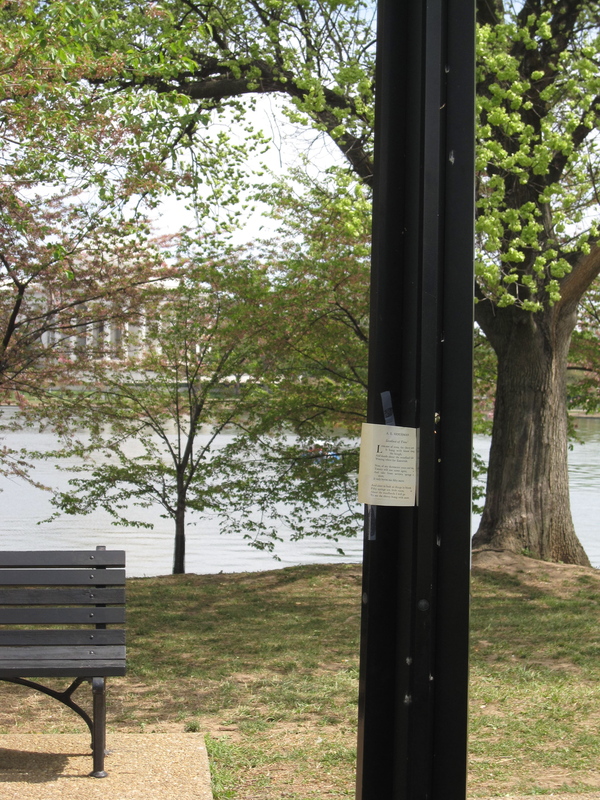 I visited my mother three days after Easter with a plan to see the cherry blossoms at the Tidal Basin and in Kenwood, a neighborhood in Maryland that for two weeks every year is one of the most magical places on earth. As a child I thought it was a fairyland. We would get out of the car and walk under a tent of pink trees that covered the width of the street. We kicked up thick layers of pale velvety blossoms and threw the petals at each other like confetti. I don’t know that I’ve ever seen anything so lovely. This April I was sure I would see the cherry blossoms again—I would arrive only two days past the peak. 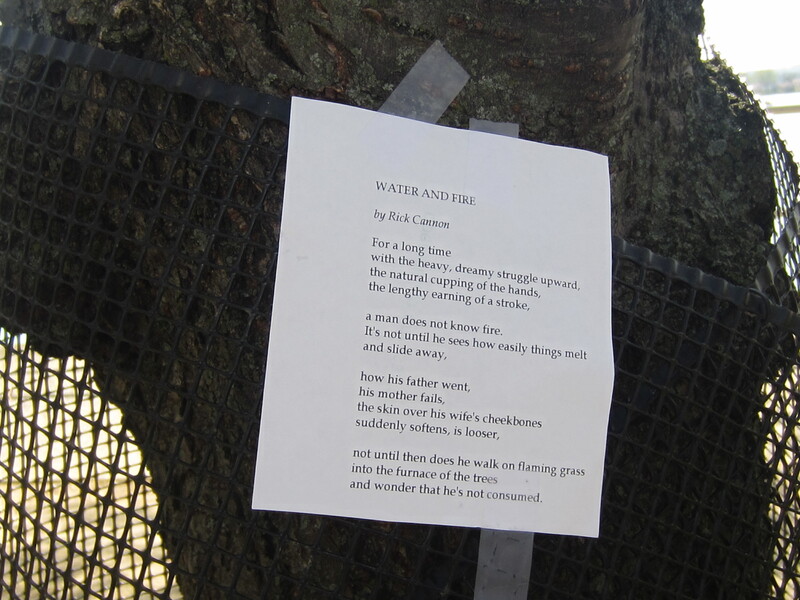 Alas, the trees in Kenwood were green with a only a hint of pink, and those at the Tidal Basin, where I posted this poem, had all but lost their delicate coloring. I wasn’t completely disappointed in the outing, though, because the sight of my 84-year old mother enjoying herself in a Tidal Basin paddle boat was a treat in itself. I love this little poem but it’s always confused me. All that math! Turns out my confusion sprang from a misapprehension of Housman’s age. I thought that he was three score year and ten, or less poetically, 70. And 70 minus 20 is 50, the additional years he says he has to enjoy the blossoms. Was he assuming that he’d live to be 120? No, but I was. Thanks to a little internet research, I now understand that threescore year and ten is a biblical reference to the average lifetime. So Housman has just passed 20 and is thinking of the 50 years he has left before he dies at 70 and never sees cherry blossoms again. I guess this shows that you don’t have to fully understand a poem to enjoy it—understanding can come over time. And also that math can make me a complete idiot. 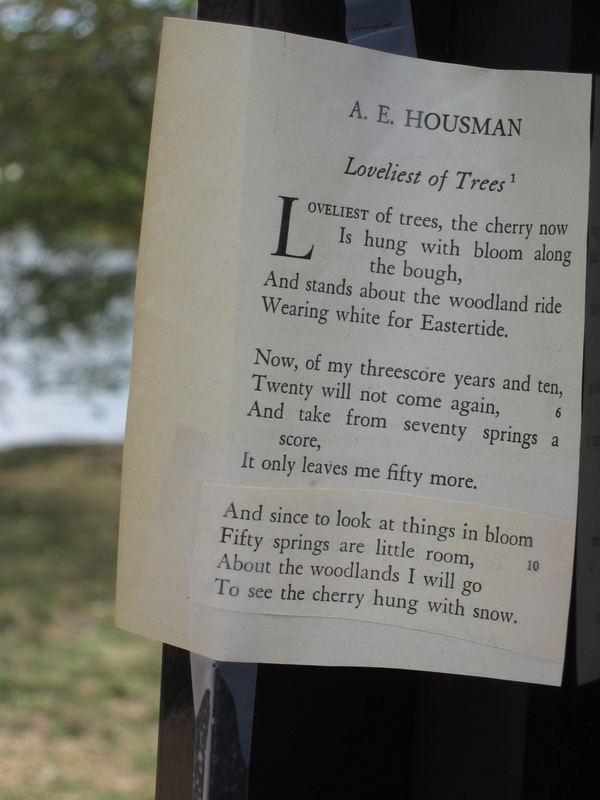 Housman actually lived to be 76, so he got in six more springs with the cherry blossoms than he had anticipated.